Early Khvalynsk: the three samples from the Samara region have quite different positions in PCA, from nearest to EHG (of Y-DNA haplogroup R1a) to nearest to ANE ancestry (of Y-DNA haplogroup Q). This could represent the initial consequences of the second wave of ANE ancestry – as found later in Yamna samples from a neighbouring region -, possibly brought then by Eurasian migrants related to haplogroup Q. With only 3 samples, this is obviously just a tentative explanation of the finds. The samples can only be reasonably said to show an unstable time for the region in terms of admixture (i.e. probably migration), judging by the data on PCA. PCA and Admixture for south-eastern Europe. Image modified from Mathieson et al. (2017) – Third revision (May 30th), used in the 2nd edition of the Indo-European demic diffusion model. This example offers yet another reason why precise anthropological context is necessary to offer the right interpretation of results. 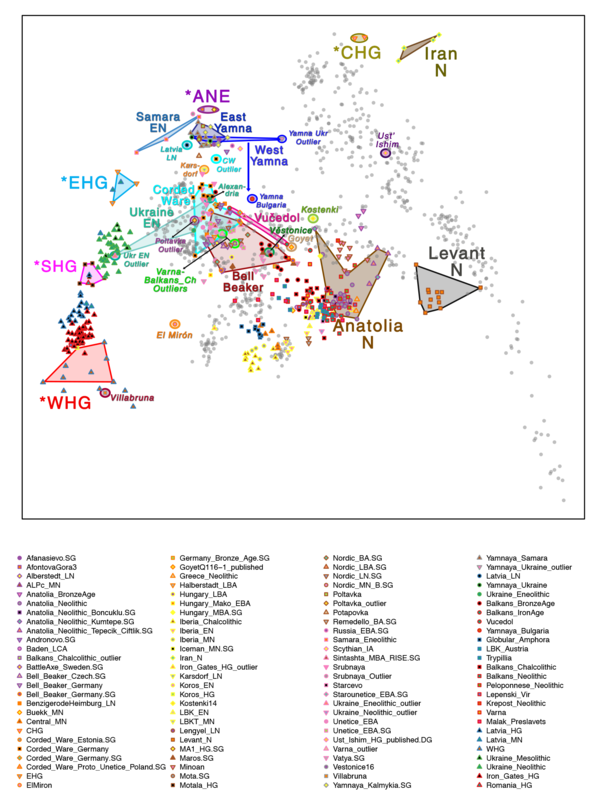 Within the Indo-European demic diffusion model – based mainly on Archaeology and Linguistics – , the sample with steppe ancestry was the most logical find in the region for a potential origin of the Corded Ware culture, and it was interpreted as such, well before the publication of the fourth version of Mathieson et al. (2017). PCA of South-East European and other European samples. Image modified from Mathieson et al. (2017) – Fourth revision (September 19th), used in the 3rd edition of the Indo-European demic diffusion model. West Yamna (to insist on the same question, the ‘yamnaya’ component): we have only four western Yamna samples, two of them showing Anatolian Neolithic ancestry (one of them, from Ukraine, with a strong ‘southern’ drift). On the other hand, Corded Ware migrants do not show this. So we could infer that their migrations were not coetaneous: whereas peoples of Corded Ware culture expanded ca. 3300 BC to the north – in the natural corridor to the Baltic that has been proposed for this culture in Archaeology for decades (and that is well represented by Ukraine Eneolithic samples) -, peoples of Yamna culture expanded to the west, replacing the Ukraine Eneolithic population (i.e. probably those of ‘Proto-Corded Ware culture’), and eventually mixing with Balkan populations of Anatolian Neolithic ancestry. Potapovka, Andronovo, and Srubna: while Potapovka clusters closely to the steppe, and Andronovo (like Sintashta) clusters closely to Corded Ware (i.e. 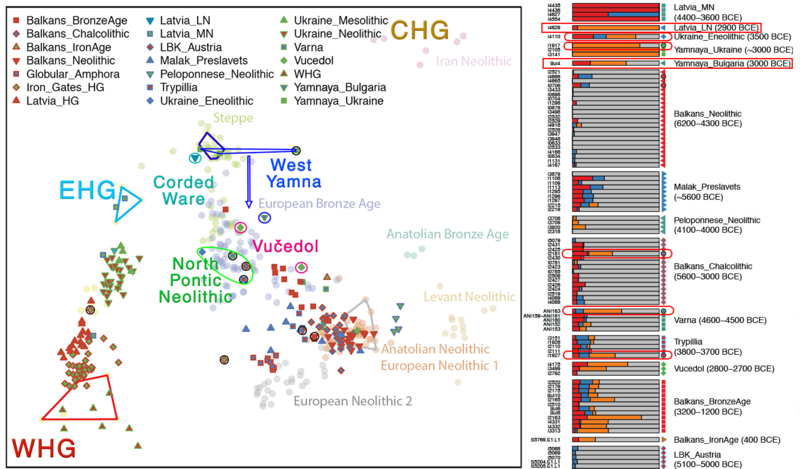 Ukraine Neolithic / Central-East European), both have certain ‘outliers’ in PCA: the former has one individual clustering closely to Corded Ware, and the latter to the steppe. Both ‘outliers’ fit well with the interpretation of the recent mixture of Corded Ware peoples with steppe populations, and they offer a different image for the evolution of populations of Potapovka and Sintashta-Petrovka, potentially influencing their language. The position of Srubna samples, nearer to Sintashta and Andronovo (but occupying the same territory as the previous Potapovka) offers the image of a late westward conquest from Corded Ware-related populations. 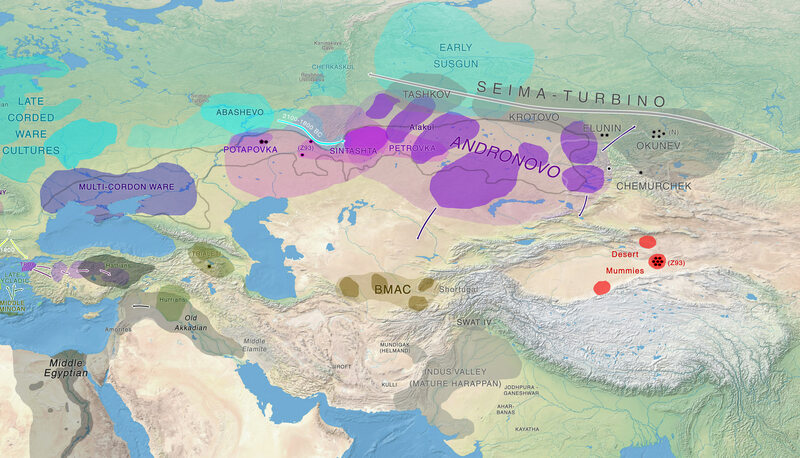 And then rapidly expanding as a Proto-Slavic-speaking community from the steppe to the west. Diachronic map of Bronze Age migrations ca. 1750-1250 BC. 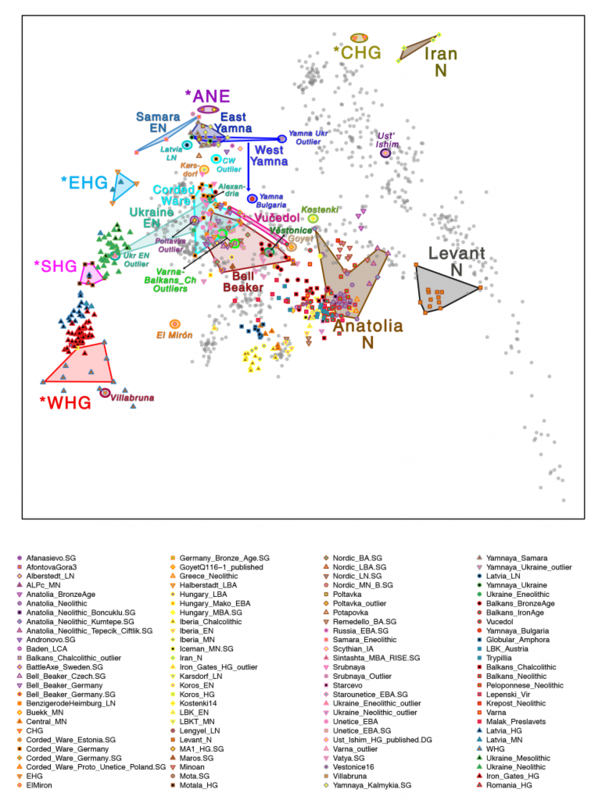 Well-defined outliers are, therefore, essential to understand a recent history of admixture. On the other hand, the very concept of “outlier” can be a dangerous tool – when the lack of enough samples makes their classification as as such unjustified -, leading to the wrong interpretations.